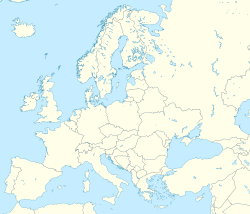 For other cities named Novgorod, see Novgorod (disambiguation). Not to be confused with Veliky Novgorod. Clockwise: Dmitrievskaya Tower of the Kremlin, Chkalov Stairs, the Fair, GAZ, Minin and Pozharsky Monument, Saint Alexander Nevsky cathedral and stadium. Nizhny Novgorod (Russian: Ни́жний Но́вгород, IPA: [ˈnʲiʐnʲɪj ˈnovɡərət]), colloquially shortened to Nizhny, is a city in Russia and the administrative center (capital) of Volga Federal District and Nizhny Novgorod Oblast. From 1932 to 1990, it was known as Gorky (Го́рький, IPA: [ˈɡorʲkʲɪj]), after the writer Maxim Gorky, who was born there. The city is an important economic, transportation, scientific, educational and cultural center in Russia and the vast Volga-Vyatka economic region, and is the main center of river tourism in Russia. In the historic part of the city there is a large number of universities, theaters, museums and churches. Nizhny Novgorod is located about 400 km (250 mi) east of Moscow, where the Oka River empties into the Volga. Population: 1,250,619 (2010 Census); 1,311,252 (2002 Census); 1,438,133 (1989 Census). The city was founded in 4 February 1221 by Prince Yuri II of Vladimir. In 1612 Kuzma Minin and Prince Dmitry Pozharsky organized an army for the liberation of Moscow from the Poles. In 1817 Nizhny Novgorod became a great trade center of the Russian Empire. In 1896 at a fair, an All-Russia Exhibition was organized. During the Soviet period, the city turned into an important industrial center. In particular, the Gorky Automobile Plant was constructed in this period. Then the city was given the nickname "Russian Detroit". During World War II, Gorky became the biggest provider of military equipment to the Eastern Front. Due to this, the Luftwaffe constantly bombed the city from the air. The majority of the German bombs fell in the area of the Gorky Automobile Plant. Although almost all the production sites of the plant were completely destroyed, the citizens of Gorky reconstructed the factory after 100 days. After the war, Gorky became a "closed city" and remained one until after the dissolution of the Soviet Union in 1990. At that time, the city was renamed Nizhny Novgorod once again. In 1985, the Nizhny Novgorod Metro was opened. In 2016, Vladimir Putin opened the new 70th Anniversary of Victory Plant which is part of the Almaz-Antey Air and Space Defence Corporation. The Kremlin – the main center of the city – contains the main government agencies of the city and the Volga Federal District. The demonym for a Nizhny Novgorod resident is "нижегородец" (nizhegorodets) for male or "нижегородка" (nizhegorodka) for female, rendered in English as Nizhegorodian. Novgorodian is inappropriate; it refers to a resident of Veliky Novgorod, in northwestern Russia. Originally the name was just Novgorod ("Newtown"), but to distinguish it from the other, older and well-known Novgorod to the west, the city was commonly called "Novgorod of the Lower lands". This land was named "lower" because it is situated downstream, especially from the point of view of other Russian cities such as Moscow, Vladimir and Murom. Later it was transformed into the contemporary name of the city that literally means "Lower Newtown". The city traces its origin from a small Russian wooden hillfort that was founded by Grand Duke Yuri II in 1221 at the confluence of two of the most important rivers in his principality, the Volga and Oka rivers. Its independent existence was threatened by the continuous Mordvin attacks against it; the major attempt made by forces under Purgaz in April 1229 was repulsed, but after the death of Yuri II on March 4, 1238 at the Battle of the Sit River, the Mongols occupied the fortress. Later a major stronghold for border protection, Nizhny Novgorod fortress took advantage of a natural moat formed by the two rivers. Along with Moscow and Tver, Nizhny Novgorod was among several newly founded towns that escaped Mongol devastation on account of their insignificance, but grew into (great) centers in vassalic Russian political life during the period of the Tatar Yoke. With the agreement of the Mongol Khan, Nizhny Novgorod was incorporated into the Vladimir-Suzdal Principality in 1264. After 86 years its importance further increased when the seat of the powerful Suzdal Principality was moved here from Gorodets in 1350. Grand Duke Dmitry Konstantinovich (1323–1383) sought to make his capital a rival worthy of Moscow; he built a stone citadel and several churches and was a patron of historians. The earliest extant manuscript of the Russian Primary Chronicle, the Laurentian Codex, was written for him by the local monk Laurentius in 1377. After the city's incorporation into the Grand Duchy of Moscow in 1392, the local princes took the name Shuisky and settled in Moscow, where they were prominent at the court and briefly ascended the throne in the person of Vasily IV. After being burnt by the powerful Crimean Tatar chief Edigu in 1408, Nizhny Novgorod was restored and regarded by the Muscovites primarily as a great stronghold in their wars against the Tatars of Kazan. The enormous red-brick kremlin, one of the strongest and earliest preserved citadels in Russia, was built in 1508–1511 under the supervision of Peter the Italian. The fortress was strong enough to withstand Tatar sieges in 1520 and 1536. 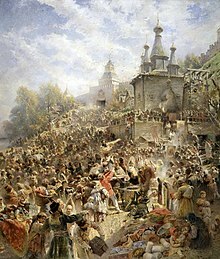 In the course of the following century, the city prospered commercially and was chosen by the Stroganovs (the wealthiest merchant family of Russia) as a base for their operations. A particular style of architecture and icon painting, known as the Stroganov style, developed there at the turn of the 17th and 18th centuries. The historical coat of arms of Nizhny Novgorod in 1781 was a red deer with black horns and hooves on a white field. The modern coat of arms from 2006 is the same, with a ribbon of order of Lenin and gold crown from above. In 1817, the Makaryev Fair, one of the liveliest in the world, was transferred to Nizhny Novgorod, and started to attract millions of visitors annually. By the mid-19th century, the city was firmly established as the trade capital of the Russian Empire. The world's first radio receiver by engineer Alexander Popov and the world's first hyperboloid tower and lattice shell-coverings by engineer Vladimir Shukhov were demonstrated at the All-Russia industrial and art exhibition in Nizhny Novgorod in 1896. According to official Imperial Russian statistics the population of Nizhny Novgorod as of 14 January 1913 was 97,000. The largest industrial enterprise was the Sormovo Iron Works which was connected by the company's own railway to Moscow station in the Lower Area of Nizhny Novgorod. The private Moscow to Kazan Railway Company's station was in the Upper Area of the city. Other industries gradually developed, and by the start of the 20th century the city was also a first-rank industrial hub. Henry Ford helped build a large truck and tractor plant (GAZ) in the late 1920s, sending engineers and mechanics, including future labour leader Walter Reuther. There were no permanent bridges over the Volga or Oka before the October Revolution in 1917. Temporary bridges were built during the trade fair. The first bridge over the Volga was started by the Moscow–Kazan Railway Company in 1914, but only finished in the Soviet Era when the railway to Kotelnich was opened for service in 1927. Maxim Gorky was born in Nizhny Novgorod in 1868 as Alexey Maximovich Peshkov. In his novels he described the dismal life of the city proletariat. When he returned to the Soviet Union in 1932 on the invitation of Joseph Stalin, the city was renamed Gorky. The city bore Gorky's name until 1990. His childhood home is preserved as a museum, known as the Kashirin House, after Alexey's grandfather who owned the place. During the World War II, from 1941 to 1943, Gorky was subjected to air raids and bombardments by Germany. The Germans tried to destroy the city industry because it was the main supplier of military equipment to the front. These attacks became the most powerful in the entire World War II in the rear of the Soviet Union. During much of the Soviet era, the city was closed to foreigners to safeguard the security of Soviet military research and production facilities, even though it was a popular stopping point for Soviet tourists traveling up and down the Volga in tourist boats. Unusually for a Soviet city of that size, even street maps were not available for sale until the mid-1970s. In 1970, by the Decree of the Presidium of the Supreme Soviet of the USSR, the city was awarded the Order of Lenin. Mátyás Rákosi, communist leader of Hungary, died there in 1971. November 20, 1985 in the city was launched the first section of the metro. The physicist and Nobel laureate Andrei Sakharov was exiled there during 1980–1986 to limit his contacts with foreigners. An end to the "closed" status of the city accompanied the reinstatement of the city's original name in 1990. Nizhny Novgorod is the administrative center (capital) of Volga Federal District and Nizhny Novgorod Oblast. Within the framework of administrative divisions, it is, together with one resort settlement and twelve rural localities, incorporated as the city of oblast significance of Nizhny Novgorod—an administrative unit with the status equal to that of the districts. As a municipal division, the city of oblast significance of Nizhny Novgorod is incorporated as Nizhny Novgorod Urban Okrug. In December 2011, Marat Safin was elected to the Russian Parliament as a member of Vladimir Putin's United Russia Party, representing Nizhny Novgorod. All of today's lower city was annexed by Nizhny Novgorod in 1929–1931. Population: 1,250,619 (2010 Census); 1,311,252 (2002 Census); 1,438,133 (1989 Census). Nizhny Novgorod is the fifth-largest city in Russia, ranking after Moscow, St Petersburg, Novosibirsk, and Yekaterinburg. For a long time it was the third-largest city after Moscow and St Petersburg. The area operates in what is referred to in international standards as Moscow Standard Time (MSK), which is 3 hours ahead of UTC, or UTC+3. Daylight saving time is no longer observed. The climate in the region is continental, specifically humid continental (Dfb), and it is similar to the climate in Moscow, although colder in winter, which lasts from late November until late March with a permanent snow cover. Average temperatures range from +19 °C (66 °F) in July to −9 °C (16 °F) in January. A maximum temperature of +38.2 °C (100.8 °F) was recorded during the 2010 Northern Hemisphere summer heat waves. Nizhny Novgorod is one of the centers of the IT industry in Russia. It ranks among the leading Russian cities in terms of the quantity of software R&D providers. Intel has a big software research and development center with more than 500 engineers in the city, as well as a major datacenter. In Nizhny Novgorod there are also a number of offshore outsourcing software developers, including Bell Integrator, Itseez, Tecom, Luximax Systems Ltd., MERA, RealEast Networks, Auriga, SoftDrom, and Teleca, and many other smaller companies specializing in the delivery of services to telecommunication vendors. There are 25 scientific R&D institutions focusing on telecommunications, radio technology, theoretical and applied physics, and 33 higher educational institutions, among them are Nizhny Novgorod State University, Nizhny Novgorod State Technical University, Privolzhsky Research Medical University, as well as Nizhny Novgorod Institute of Information Technologies, that focuses on information technologies, software development, system administration, telecommunications, cellular networks, Internet technologies, and IT management. Nizhny Novgorod has also been chosen as one of four sites for building an IT-oriented technology park – a special zone that has an established infrastructure and enjoys a favorable tax and customs policy. Engineering is the leading industry of Nizhny Novgorod's economy with transportation – the auto industry, shipbuilding, diesel engines, aircraft manufacture and machine tools – predominating; the auto industry being the leading sector (50%). Public transportation within the city is provided by a trams, marshrutkas (routed taxis), buses, and trolleybuses. Electric and diesel commuter trains run to suburbs in several directions. Nizhny Novgorod City Rail is a network of railway transport (S-Train) in the city. Together with the metro it forms a system of high-speed rail transport of the city. It has two lines: Sormovskaya and Priokskaya. It was founded on June 24, 2013 on the basis of the Gorky Railway, as an addition to the metro. Nizhny Novgorod Metro underground rapid transit system was opened in 1985; it now has two lines with 15 stations, connecting all five railway terminals, and carrying 102,000 passengers daily. Emperor's Pavilion on Moskovsky railway terminal. The Gorky Railway, a Russian Railways department which operates some 5,700 km (3,500 mi) of rail lines throughout the Middle Volga region and 1,200 km (750 mi) in Nizhny Novgorod Oblast, is headquartered in Nizhny Novgorod. Since 1862, there has been a railway connection between Nizhny Novgorod and Moscow. Overnight trains provide access to Nizhny Novgorod from Moscow, Saint Petersburg, Kazan, Yaroslavl and others. А fast train transports passengers between Nizhny Novgorod and Moscow in less than four hours. One can continue from Nizhny Novgorod eastward along the Trans-Siberian Railway, with direct trains to major cities in the Urals and Siberia, as well as to Beijing, Pyongyang, and Ulan-Bator. The first high-speed rail Sapsan train to Moscow (Kursky Rail Terminal) and Saint Petersburg (Moskovsky Rail Terminal) was launched on July 30, 2010. The route has been run using Strizh trains since 2015. Suburban commuter trains (elektrichka) connect Nizhny Novgorod with Vladimir, Dzerzhinsk, Murom, Kirov, Arzamas, Zavolzhye, Balakhna, and others. Nizhny Novgorod is an important center of Volga cargo and passenger shipping. During summer, cruise vessels operate between Nizhny Novgorod, Moscow, Saint Petersburg, and Astrakhan. In 2006 a small number of Meteor-class hydrofoils resumed operations on the Volga river. The city is served by the Russian highway M-7 (Moscow – Nizhny Novgorod – Kazan – Ufa), and is a hub of the regional highway network. Also through the city passes the federal highway P158 (Nizhny Novgorod – Saransk – Penza – Saratov). Scherbinki Bus Station, a few miles south of downtown. Mostly serves directions east and south. Out of the three bus terminals, only the Kanavino station is near a subway line; the other two are connected with the rest of the city by city buses. In 2012, the cableway connecting Nizhny Novgorod and Bor was launched. The length of the cableway is 3.5 km (2.2 mi). It has the largest unsupported span in Europe above the water surface is 861 metres (2,825 feet). The main purpose is to provide an alternative type of passenger transportation in addition to river taxis, electric trains and buses. The cable car has also become a popular tourist attraction, thanks to panoramic views from the cabins. Not far from Nizhegorodskaya station there are the Nizhny Novgorod Cathedral Mosque and Pechersky Ascension Monastery.100 metres (330 feet) from the Borskaya station is located the park of historical reconstruction of Pax Romana, which represents a collective image of a site of the Roman borderland at the turn of the 1st-2nd centuries AD, with a military camp and a small town that developed from the Marktant village at the camp. July 31, 2014 on the cable car there was an incident. The lightning struck a metal support near the booth in which people were. At this time there was a heavy thunderstorm and the cable car was stopped. However, people were already in the cabins. Nizhny Novgorod is served by Strigino International Airport, which has direct flights to major Russian cities, Europe and the Middle East. The air base Sormovo was an important military airlift facility, and Pravdinsk air base was an interceptor aircraft base during the Cold War. S7 Airlines and UTair Aviation fly to Moscow's Domodedovo and Vnukovo Airports daily. It is unknown when the first aerodrome in Nizhny Novgorod was built, but its location was 0.5 km (0 mi) north from where the "Moscow" movie theater stands today. This aerodrome was named Nizhny Novgorod Airport. In 2011 HC Airports of Regions won their bid on the investment project into Nizhny Novgorod International Airport. In 2012, certain renovations were made in order to more efficiently exploit the existing facility whilst the new one is being built. In June 2014, the construction of new terminal started. It is supposed to be opened by December 2015 and be able to handle around 300 passengers per hour. The second terminal will be built after the 2018 FIFA World Cup, hosted by Nizhny Novgorod among others, and the aforementioned railway station is planned to be constructed during that time as well. The new terminal was opened on December 29, 2015 as the first flight, from Moscow, was directed there. Airport authority plans to redirect all the domestic flights to the new terminal by February 2016 and all the international flights by April 2016. Much of the city downtown is built in the Russian Revival and Stalin Empire styles. The dominating feature of the city skyline is the grand Kremlin (1500–1511), with its red-brick towers. After Bolshevik devastation, the only ancient edifice left within the Kremlin walls is the tent-like Archangel Cathedral (1624–1631), first built in stone in the 13th century. There are more than 600 unique historic, architectural, and cultural monuments in the city. There are about 200 municipal and regional art and cultural institutions within Nizhny Novgorod. Among these institutions there are eight theaters, five concert halls, 97 libraries (with branches), 17 movie theaters (including five for children), 25 institutions of children's optional education, eight museums (16 including branches), and seven parks. The center of the fair was the main building in the spirit of classicism and the side administrative buildings that formed the central square. To protect from floods, a 3.5 m (11 ft) high dam was built. On November 4, 2017, a new multimedia exhibition called "Russia is My History" was opened in the Main Fair Building. The main focus of the exhibition is the history of Nizhny Novgorod, starting from Finno-Ugric peoples. On the territory of the complex there are departments in which they tell about the foundation of the city, the struggle for independence in the Time of Troubles and the bombing of the city during the World War II. On the first day of work, the entrance to the exhibition was free, because of which a long line lined up in front of the Main Fair Building. The art gallery in Nizhny Novgorod is a large and important art gallery and museums of human history and culture. Nizhny Novgorod has a great and extraordinary art gallery with more than 12,000 exhibits, an enormous collection of works by Russian artists such as Viktor Vasnetsov, Karl Briullov, Ivan Shishkin, Ivan Kramskoi, Ilya Yefimovich Repin, Isaak Iljitsch Lewitan, Vasily Surikov, Ivan Aivazovsky, there are also greater collections of works by Boris Kustodiev and Nicholas Roerich, not only Russian art is part of the exhibition it include also a vast accumulation of Western European art like works by David Teniers the Younger, Bernardo Bellotto, Lucas Cranach the Elder, Pieter de Grebber, Giuseppe Maria Crespi, Giovanni Battista Piranesi, and lot more. Finally what makes this gallery extremely important is the amazing collection Russian avant-garde with works by Kazimir Malevich, Wassily Kandinsky, Natalia Goncharova, Mikhail Larionov and so on. There is also collection of East Asian art. Other notable landmarks are the two great medieval abbeys. The Pechersky Ascension Monastery features the austere five-domed cathedral (1632) and two rare churches surmounted by tent roofs, dating from the 1640s. 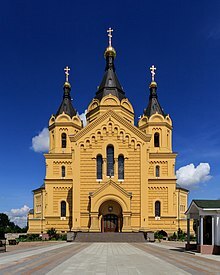 The Annunciation monastery, likewise surrounded by strong walls, has another five-domed cathedral (1649) and the Assumption church (1678). The only private house preserved from that epoch formerly belonged to the merchant Pushnikov. There can be little doubt that the most original and delightful churches in the city were built by the Stroganovs in the nascent Baroque style. Of these, the Virgin's Nativity Church (1719) graces one of the central streets, whereas the Church of Our Lady of Smolensk (1694–97) survives in the former village of Gordeyevka (now, part of the city's Kanavinsky District), where the Stroganov palace once stood. the wooden chapel of the Intercession (1660), transported to Nizhny Novgorod from a rural area. There is also a mosque in Sennaya Square, where the Muslim populations of the city go for Friday prayers, Islamic activities and activities which are organized by the mosque. There is also a small shop to buy halal meats. Most of the Muslims in this city are Tatars. The centrally located Nizhny Novgorod Synagogue was built in 1881–1883; disused during the Soviet era, it was renovated and reopened circa 1991. The Chkalov Staircase connecting Minin and Pozharsky Square, the Upper Volga and the Lower Volga embankments. It was built by the architects Alexander Yakovlev, Lev Rudnev and Vladimir Munts. The staircase itself was constructed in the late 1940s by German prisoners of war forced to labor around Gorky. It is the longest staircase in Russia. The staircase starts from the monument to Chkalov, near St. George's Tower of the Kremlin. It is built in the form of a figure of eight and consists of 560 steps, if you count it both sides. The number of steps from the bottom to the top is 442 on the right. In the intersections of the side slopes there are two observation platforms. At the bottom of the stairs is a monument to the boat "Hero", which is located at the Lower Volga embankment. Standing on a spit of the Volga and Oka Rivers in the city center is the international-class Nizhny Novgorod Stadium. This arena will host six games of the 2018 FIFA World Cup. After the World Cup, the stadium will serve as a multipurpose sports complex. A singular monument of industrial architecture is a 128 m (420 ft) open-work hyperboloid tower built on the bank of the Oka near Dzerzhinsk as part of a powerline river crossing by the eminent engineer and scientist Vladimir Shukhov in 1929. There are also twenty research institutes located in the city. During the World Cup, the Minin and Pozharsky Square hosted the FIFA Fan Fest. The venue was open on game days from 13.00 till 00.00. The Fan Fest venue included a hospitality area, a folk art craft shop and food outlets (20 stationary and 7 mobile outlets). The games were broadcast on a big screen. Nizhny Novgorod is the center of the television and radio broadcasting on the region and the Volga Federal District. There are local TV stations, the Internet and print media. In city, there are some popular urban newspapers. Nizhegorodskaya Pravda, Stolitsa Nizhny and Nizhegorodsky rabochiy are Russian-language media headquartered in Nizhny Novgorod. Nizhegorodskaya pravda is the oldest newspaper of the city. One of the first TV channel in the city is NNTV. It was created during the Soviet period, on the basis of the Gorky television. Also there is the TV channel Volga. The earlier existing most popular TV channel - Seti-NN, but he stopped broadcasting in December 2015. "Dorozhnoe Radio (Radio of roads)"
^ a b "Founding of Nizhny Novgorod". nizhnynovgorod.com. Retrieved August 15, 2016. ^ "Мэром Нижнего Новгорода избран Владимир Панов". The Village (in Russian). Retrieved January 17, 2018. ^ "Contacts". adm.nnov.ru. Retrieved August 15, 2016. ^ "Nizhny Novgorod". calend.ru. Retrieved August 15, 2016. ^ "Нижний Новгород – Столица Поволжья и "карман России" | www.Nischni-Nowgorod.ru". www.nischni-nowgorod.ru (in German). Retrieved July 31, 2017. ^ a b "Всесоюзная перепись населения 1989 г. Численность наличного населения союзных и автономных республик, автономных областей и округов, краёв, областей, районов, городских поселений и сёл-райцентров" [All Union Population Census of 1989: Present Population of Union and Autonomous Republics, Autonomous Oblasts and Okrugs, Krais, Oblasts, Districts, Urban Settlements, and Villages Serving as District Administrative Centers]. Всесоюзная перепись населения 1989 года [All-Union Population Census of 1989] (in Russian). Институт демографии Национального исследовательского университета: Высшая школа экономики [Institute of Demography at the National Research University: Higher School of Economics]. 1989 – via Demoscope Weekly. ^ Vladimir Kuchin (2018). Десять веков Нижегородского края. 1152—2018. 3. Издательские решения. ISBN 978-5-4490-6270-3. ^ "Д1 (2 чтение) ФЗ №186614-6 "О мерах воздействия на лиц, причастных к нарушению основополагающих прав и свобод человека, прав и свобод граждан РФ" – Система анализа результатов голосований на заседаниях Государственной Думы". Vote.duma.gov.ru. December 19, 2012. Retrieved July 18, 2013. ^ "Pogoda.ru.net" (in Russian). Weather and Climate (Погода и климат). Retrieved December 10, 2015. ^ "Gorkij (Nizhny Novgorod) Climate Normals 1961-1990". National Oceanic and Atmospheric Administration. Retrieved April 8, 2015. ^ "> "Technical and operational parameters of subways in 2015" (PDF). The International Association "Metro". ^ "Google". Archived from the original on June 20, 2012. Retrieved June 23, 2012. ^ "Russian Railways Sapsan to Nizhny Novgorod press release". ^ "Канатная дорога через Волгу "Нижний Новгород - Бор" начала работу". Российская газета (in Russian). February 9, 2012. Retrieved July 16, 2018. ^ "В Нижнем Новгороде во время грозы в канатную дорогу ударила молния". progorodnn.ru (in Russian). Retrieved July 16, 2018. ^ "Россия – российские авиалинии". Rossiya-airlines.com. July 25, 2007. Retrieved November 16, 2012. ^ "Нижний Новгород-Церковь Собора Пресвятой Богородицы ("Строгановская")". ^ "Нижний Новгород. Церковь Смоленской иконы Божией Матери, фотография". ^ "Нижний Новгород-Собор Происхождения Честных Древ Креста Господня (Спасский Староярмарочный)". ^ "Нижний Новгород-Кафедральный собор Александра Невского ("Новоярмарочный")". ^ "Нижний Новгород. Церковь Рождества Иоанна Предтечи на Торгу, фотография". ^ "Нижний Новгород. Церковь Жён-Мироносиц на Верхнем посаде, фотография". ^ "Нижний Новгород. Церковь Илии Пророка, фотография". ^ "Нижний Новгород. Церковь Успения Пресвятой Богородицы на Ильинской горе, фотография". ^ "Нижний Новгород. Церковь Успения Пресвятой Богородицы на новом Бугровском кладбище, фотография". ^ "Нижний Новгород. Музей-заповедник "Щёлоковский хутор". Церковь Покрова Пресвятой Богородицы из с. Зелёного Городецкого района, фотография". ^ "Нижегородский институт управления - филиал РАНХиГС (бывш. ВВАГС)". Vvags.ru. June 25, 2012. Archived from the original on December 24, 2012. Retrieved March 26, 2013. ^ "List of Twin Towns in the Ruhr District" (PDF). © 2009 twins2010.com. Archived from the original (PDF) on November 28, 2009. Retrieved October 28, 2009. Munro-Butler-Johnstone, Henry Alexander, A trip up the Volga to the fair of Nijni-Novgorod, Oxford: J. Parker and co., 1876. Городская Дума города Нижнего Новгорода. №91 23 ноября 2005 г. «Устав города Нижнего Новгорода». Вступил в силу с 1 января 2006 г., но не ранее официального опубликования после государственной регистрации, за исключением подпункта 13 пункта 10 статьи 43, вступающего в силу в сроки, установленные федеральным законом, определяющим порядок организации и деятельности муниципальной милиции. Опубликован: "Нижегородский рабочий", №234/15894, 30 декабря 2005 г. (City Duma of the City of Nizhny Novgorod. #91 November 23, 2005 Charter of the City of Nizhny Novgorod. Effective as of January 1, 2006, but not earlier than the official publication date following the state registration, and with the exception of subitem 13 of item 10 of Article 43, which takes effect during the timeframe to be set by a federal law legislating the organization and functioning of the municipal militsiya.). Законодательное собрание Нижегородской области. Закон №184-З от 16 ноября 2005 г. «Об административно-территориальном устройстве Нижегородской области», в ред. Закона №58-З от 5 мая 2016 г «О внесении изменений в Закон Нижегородской области "Об административно-территориальном устройстве Нижегородской области"». Вступил в силу по истечении десяти дней со дня официального опубликования. Опубликован: "Нижегородские новости", №218(3390), 23 ноября 2005 г. (Legislative Assembly of Nizhny Novgorod Oblast. Law #184-Z of November 16, 2005 On the Administrative-Territorial Structure of Nizhny Novgorod Oblast, as amended by the Law #58-Z of May 5, 2016 On Amending the Law of Nizhny Novgorod Oblast "On the Administrative-Territorial Structure of Nizhny Novgorod Oblast". Effective as of after ten days from the day of the official publication.). Законодательное Собрание Нижегородской области. Закон №205-З от 22 декабря 2005 г. «О утверждении границ, состава территории городского округа город Нижний Новгород», в ред. Закона №16-З от 7 февраля 2011 г «О внесении изменений в отдельные Законы Нижегородской области». Вступил в силу по истечении десяти дней со дня официального опубликования. Опубликован: "Нижегородские новости", №2(3414), 11 января 2006 г. (Legislative Assembly of Nizhny Novgorod Oblast. Law #205-Z of December 22, 2005 On Establishing the Borders, Territorial Composition of the Urban Okrug of the City of Nizhny Novgorod, as amended by the Law #16-Z of February 7, 2011 On Amending Various Laws of Nizhny Novgorod Oblast. Effective as of after ten days from the day of the official publication.). Президиум Верховного Совета РСФСР. Указ от 22 октября 1990 г. «О переименовании города Горького в город Нижний Новгород и Горьковской области в Нижегородскую области». (Presidium of the Supreme Soviet of the RSFSR. Decree of October 22, 1990 On Changing the Name of the City of Gorky to the City of Nizhny Novgorod and the Name of Gorky Oblast to Nizhny Novgorod Oblast. ). 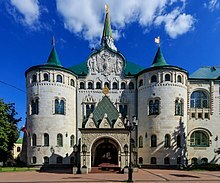 Wikivoyage has a travel guide for Nizhny Novgorod. This page was last edited on 14 April 2019, at 00:41 (UTC).